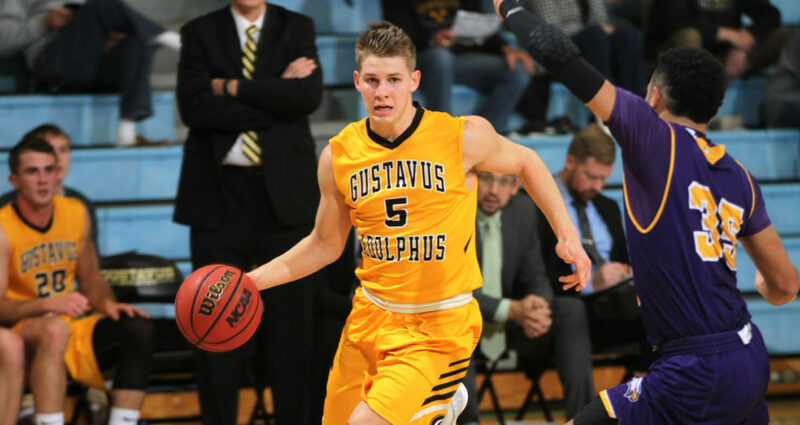 SAINT PETER, Minn. – The Gustavus men’s basketball team took on the Northwestern Eagles Saturday night in a back-and-forth battle that saw the Gusties come out on top by a score of 71-68. The Gusties win moves their record to 1-1 while the Eagles fall to 2-1. The Gusties took an early 16-12 lead thanks to a very balanced offensive attack seeing five different players score points with Vannis Smith (Jr., Crystal Lake, Ill.) and Peter Lundquist (So., Rochester, Minn.) each scoring four. The Eagles fought back going on a 20-7 run to take a 32-23 lead, the largest by either team on the night. Logan Rezac (So., Andover, Minn.) had a solid night for the Gusties tallying 12 points to go along with seven rebounds and he hit two big three-pointers for the Gusties near the end of the half that helped them pull within three going into halftime. With the Eagles leading 41-38 at the half, the Gusties came out strong again in the second half and took a 46-45 lead thanks to an Isaac Douglas (So., Montevideo, Minn.) three-pointer with 15:01 left to play. Gustavus extended their lead to six with just under nine minutes to play after Nolan Malo (Fy., Owatonna, Minn.) scored two of his 10 points off an assist from Riley Sharbono (Sr., Marshall, Minn.). The Eagles battled back and the two teams played through eight lead changes from the 4:10 to the 1:07 mark in the second half before Sharbono made two free throws with five seconds left to give him a team-leading 13 points and give the Gusties a 71-68 lead. The Eagles last second three for the tie was missed and the Gusties took home the three-point victory. The Gusties will next head to Buena Vista on Tuesday for a 7 p.m. contest. “Buena Vista is very athletic and small team and that will test our line-ups out a bit. All these games we’re playing are part of the process to getting ready for the MIAC regular season.